An occassional blog by an online media veteran and trade union activist in the new media sector. IN THE AGE of technological integration in the media, the term Web 2.0 has increasingly become common currency. Even where the term is not used, the fundamental concepts of user participation and feedback have infused many of the ideas that have gone hand-in-hand with the major changes in work practices that have excited, worried and infuriated working journalists in varying measures. So what's wrong with it? Isn't increased participation and feedback from our "users" -- readers and viewers -- a good thing? Of course it is, but the problem with Web 2.0 is not how it introduces these elements to the media, but how it's seen as replacing traditional media. Professional media provide users with something that we need to fight to retain – truly authoritative content. The professional journalist brings training, experience and access to a variety of sources that may be inaccessible to the average person. They have the ability to produce content that informs and fulfil an essential part of democracy – the widespread dissemination of information that allows the public to question those in charge. The Internet has always contained the potential to change the media. The ability to challenge authority, to provide an alternative narrative and to present a variety of points of view is what the Internet provides. But the idea that, instead of posting comments below a journalistic article, we get rid of the article altogether and just have the comments is truly dangerous. There are those who claim that Web 2.0 democratises the media. It would make everyone equal, yes, but should they be? It’s like saying anyone can play for Manchester United. In one of the main examples given to explain Web 2.0, Wikipedia replaces Britannica Online. Is that the kind of democracy we want – where anyone can determine the information that the public can access, regardless of their level of knowledge, expertise or agenda? Is it really that black and white? I think you've oversimplified this "debate" to make a point that in no way reflects reality. The reality is, the Web presents challenges to traditional media, and we need to adapt somehow. And actually, the prescription for doing just that, oddly, is exactly the point you're making: authority. We "traditional" journalists do have something to contribute, we do bring more to the table than the ability to type quickly and use a telephone, as these "citizen journalists" are finding out. It's not an easy job to do well. So, once all the hype and hoopla dies down, I have to believe there will still be a marketplace out there for quality. And that is how we compete in this new environment successfully. You, on the other hand, seem to be saying we should simply declare victory before the match even really begins. It just doesn't work that way, I'm afraid. Firstly, there's a mistake in your interpretation - Web 2.0 is not the Web, it's a philosophy about "new" web. I agree with your other points entirely, the problem is that too many of our employers in this industry don't. I agree, I do think there will be a market, or more correctly, an audience for what journalists produce. I am worried, though, that the avenues for publishing them to a broad audience are going to shrink. Every journalist can blog, true, and they might well be very popular blogs, but is that really the same as properly resourced newsrooms and investment in quality output? Web 2.0 is more than merely a 'philosophy', surely. It involves the opening up of a new set of possibilities because of the nature of the new interactive and participatory technologies that now operate across the Web. the philosophy, such as it is, is simply a reflection of the burgeoning capabilities for individual production and publication, for social networking, for the use of the Web as the platform for so many different facets of life, and so on. I think you are falling into the same trap that Andrew Keen so spectacularly jumped into with his 'Cult of the Amateur' - namely, you see the 'professional' media as the primary source of 'authority'. If I look around at the 'professional media' it would not take me long to point out example after example, on a daily basis, in which the traditional media fall far short of the kind of authoritative standing you would endow them with. The problem is not with any potential deficit in 'authority' - that has always existed, thoughout the era of traditional media - it is in opening up the media to genuine diversity and a multiplicity of views. People will still require to practise discrimination, of course, but least it can be practised on a media landscape that offers a greater breadth of opinion and prejudice than does the traditional media on their own. As has always been the case, I'm afraid, there are still too many of your professional colleagues who put the story ahead of the truth. Everyone and anyone who has ever been the subject of a piece in the traditional media knows that the newspapers, TV, radio, etc very rarely get the facts of the story right. At least the new Web allows scope for a response from those who suffer at the hands of the 'authoritative' media! "The Internet has always contained the potential to change the media. The ability to challenge authority, to provide an alternative narrative and to present a variety of points of view is what the Internet provides. But the idea that, instead of posting comments below a journalistic article, we get rid of the article altogether and just have the comments is truly dangerous." Truly dangerous? - why? But anyway, that wasn't what was being proposed - or at least not in my interpretation. The point is that it allows for response, for participation, for democratisation. Actually, it allows us to do what we are doing here - to have a serious debate about the validity of a point of view. To say that 'users' should only be fed content that is validated by supposed professional expertise is to imply that those users are not able to think for themselves. But what Web 2.0 does is to make people think more, because they are offered a wider range of points of view. I won't suggest that this is what it always does, but certainly it is what it can do. I think there is actually a very strong case to suggest that the mediasphere needs highly professional content of the sort you espouse. The same is true in any walk of life. We do need sources that we think of as 'reliable' but what we don't need is to believe that that is all there should be. 'Authority' does not flow like magic out of certain structures or institutions which have supposedly been put in place to channel it. If any traditional print media have 'authority' on any subject it is because they have earned it by being correct more often than not. Anyone else working in any medium they choose can earn authority simply by being authoritative. 'Web 2.0' is meaningless jargon anyway, the lazy invention of scribes who have no handle at all on what is actually taking place. I think you are just worried about having to earn your keep, and want the mantle of 'authoritativeness' handed to traditional media just because it has traditionally been so. You don't fully understand what is coming up, so you denigrate and ridicule it. The medium may well be the message, but that does not mean that some media have 'better' messages than others. Your arguement is elitist, reactionary, and far from authoritative. I guess that's why you posted it on your blog. Jonathan, when did I mention the word "print" when I said traditional journalism? Traditional journalism is not the same as traditional media, the latter is the format, the former is the practice: reporters, sub-editors, etc. I don't even work in the mainstream media. If Web 2.0 is meaningless, then how come so many media bosses keep talking about it? I absolutely agree with you, authority is earned by hard work and quality. Unfortunately, what's happening at the moment in the industry is creating more work for fewer journalists and lower quality work. Authority is being abandoned - which is my whole argument. I've no problems with those that are lumped together under the term "Web 2.0", my problem with it is how those in positions of power in the media are using it because they're swallowing the PR that the public will do the work and quality isn't important. @NickP - we're on the same page here, except, unfortunately, media owners and controllers unfortunately don't agree. 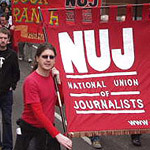 Having followed the NUJ debate, I think the problem stems from the fact certain elements of the changing media world are detrimental to people working in publishing, and the NUJ needs to be far clearer and obvious in pointing out exactly where the risks are, and more social in engaging in the debate. A headline like Web 2.0 is rubbish is shockingly ill-advised. Professional media doesn't provide truly authoritive content. It provides content from journalists trained to build contacts, examine stories, and with the facilities to probe deeper than someone blogging from home. "A headline like Web 2.0 is rubbish is shockingly ill-advised." I disagree and nothing about what people have said since has changed my mind, in fact it's strengthened my view. I don't see Web 2.0 as being blogs, or social networking, or wikis - they're basically logically continuations of the basic ideas and functionality of the web (and look - Tim Berners-Lee agrees: http://arstechnica.com/news.ars/post/20060901-7650.html). The term is hype, the idea of a "second generation" of the web is meaningless hype. And the biggest problem with it is how media proprietors think the ideas contained within it are the perfect way to make even bigger profits to feed their pockets and share-holders - get rid of journalists and get the public to write their own newspapers/websites/etc. Surely the future of Web 2.0 and 'traditional' journalism is co-existence rather than replacement? While I squirm with embarrassment each time I see a TV news reader go through emails or listen to a radio presenter read text messages out during a news bulletin, the fact that they are atually within a bulletin suggests the 'traditional' skills and media will remain. Web 2.0 does in my opinion, give media bosses committed to P&L rather than quality of output, an easier route to maintain "content" while reducing costs but equally it allows for much greater informed debate and discussion. Audiences are now in the centre of the journalistic process rather than at the end of a very linear input/output model and well all need to understand how to maximise the benefits that Web 2.0 brings while mitigating risks. Web 2.0 is certainly not rubbish, we're just struggling to fully understand its full implications. Your example of emails and texts is a perfect example of the problem with this debate - neither of them have anything to do with so-called "Web 2.0". I was working with these technologies and promoting audience engagement years ago - particularly during the Foot and Mouth crisis in 2001. Think I have spotted why you think Web 2.0 is rubbish - it's because you aren't in the least interested in hearing what other people think unless you think they agree with you! Of all the comments made in response to this article you seem disinclined to take on board anything that suggests you might be mistaken. So, it seems that the opportunity to engage with others, like minded or not, is a waste of time and effort for you, meaning that much of what 'Web 2.0' might enable has no value in your perception... thing is, lots (and lots) of people disagree with you. Ah well! Better luck next time! Web 2.0 doesn't enable anything, it's just a term, just a concept. It's not blogs, it's not social networks, it's not Wikis - it's just some people's term for them. It's technologically meaningless and, as I point out in the article, has dangerous implications for professionalism when taken on board by media owners seeking to do things on the cheap. I am an online journalist with over ten years’ professional experience. I am Vice President of the National Union of Journalists and a very active member of the union as long as I've been working as a journalist.